Freshen your home from the floors up this Spring! SPRING CLEANING — RUG CLEANING and other Cleaning and Repair Services! Professional cleaning of your rugs means they’re less likely to attract moths. Because hand-knotted Oriental rugs have a wool pile, and sometimes wool warp and weft, they are susceptible to moth damage. While weekly vacuuming is important, it’s not the complete cleaning solution. Occasional professional cleaning removes embedded dirt deep within the pile and increases the longevity of your rugs! DILMAGHANI DOES NOT CLEAN ORIENTAL RUGS IN THE HOME. WHEN YOUR ORIENTAL RUGS NEED CLEANING, THEY MUST BE CLEANED IN A PROFESSIONAL RUG CLEANING PLANT. HOME CLEANING OF ORIENTAL RUGS IS NEVER RECOMMENDED AND CAN HARM YOUR VALUABLE RUGS! Home cleaning of machine made or wall-to-wall machine carpet can be accomplished by proper professional methods. Dilmaghani provides – in-home rug cleaning for wall-to-wall carpeting. Upholstery and drapery cleaning service in your home too! When your rugs are professional cleaned, it’s a good time to purchase fresh rug pads. Dilmaghani’s cleaning service provides minor repair service such as worn fringes or loose binding. Some repairs are done in our Scarsdale repair department. Photos of repair needs must be sent to: [email protected] prior to making an appointment for the rug repair. Dilmaghani, your best choice for Rug Cleaning and more! Dilmaghani’s Oriental Rug Cleaning service includes free pick-up and delivery in the Tri-State area. Dilmaghani’s Brewster Warehouse/Outlet has Valentine gifts year around! 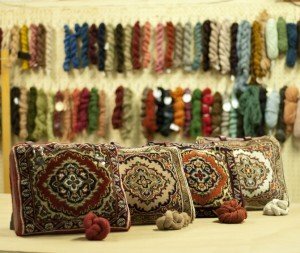 From miniature silk rugs, Oriental rug “briefcase” bags to room size and oversize rugs. You’ll find beautiful, works of art, as gifts or for your home or office at the lowest prices. Open to the public Fridays & Saturdays 10am – 5pm. Dilmaghani has beautiful gift items for the holiday season! Small Tree of Life mini – silk or wool rugs for hanging, Oriental rug purses, small mats for tables, welcome mats and of course, rugs in every size and design you may wish for yourself! Visit our website, visit our showrooms and treat yourself or your friends to unique gifts! Spring is a great time to refresh your home with Beautiful Dilmaghani Rugs! Visit our Scarsdale Rug Showroom ( Tue-Sat, 10:30am-5:00pm ) and Brewster Rug Warehouse / Outlet ( Fri, Sat 10:00am-5:00pm ) for a huge selection of beautiful rugs in all sizes and designs at the best prices anywhere! Dilmaghani’s Cleaning Service specializes in Oriental rugs. With no extra charge for pick up and delivery, the cost to you is reasonable! Remember, Oriental rugs cannot be deep cleaned in your home. They must be taken to a washing plant where they can be specially treated, washed and hung to dry in a temperature controlled drying room. Dilmaghani also provides in home cleaning for broadloom carpets and furniture. Phone: 1-800-232-3462. Collection of old rugs and carpets from Persia and other rug weaving countries in History. Famous for the smaller twin "Ardebil" and "Coronation Carpet"[s]. Houses one of the Twin "Ardebil Carpet"[s] and many fine antique Persian rugs as well as Tribal and Caucasian.